I have been looking at maps of my name at http://publicprofiler.org/. 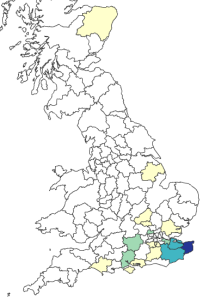 It indicates the Foad name is very strongly associated with Kent, more so than I expected. It was fun looking up some other surnames from my extended family too. I first came across this site ten years ago when it was at www.spatial-literacy.org/UCLnames/, and noticed it again now only because I was updating my old broken links. It seems to be run by a few academics. Their Great Britain Family Names Profiler shows more detail than their World Family Names Profiler. The site asked for my email address and one or two other personal details before showing me the maps, and I was willing to submit these.